Your short break in the city center! Do you have 4 hours or more to spend in Vienna? Why not take a trip to the city center and explore the capital of Austria and some of its most famous sights? With the City Airport Train you’ll reach the very center of Vienna within 16 minutes, with a reliable connection every 30 minutes. • Ticket for the ride on the Vienna Ring Tram for one Ring tour (once the ticket has been validated, it is valid for 30 minutes - 1 round). The Vienna Ring Boulevard is an Austrian World Heritage Site. The majestic road with its side alleys was laid out in the mid-19th century around the center of the city, replacing the old city walls. Ornate buildings such as the State Opera, parliament buildings, the City Hall, The Imperial Theatre and numerous palaces were erected along the Ring. All of these sights can be viewed from the Vienna Ring Tram, irrespective of the weather. Hop onboard and enjoy the tour in German, English, French, Italian, Spanish, Hungarian, Russian or Japanese. The version in Viennese dialect and a channel for children are also popular with German-speaking visitors. 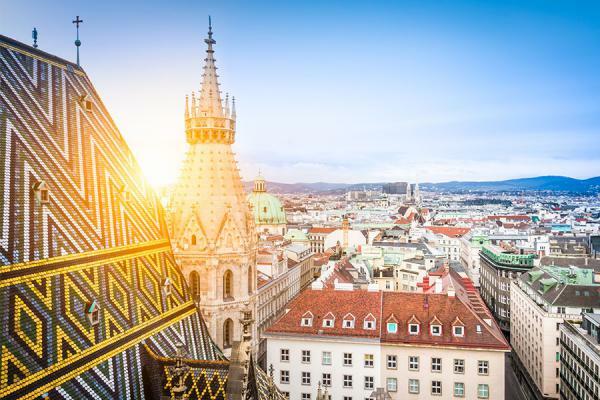 This package includes a CAT Return Ticket, entry to the Mozarthaus Vienna including special exhibition and Audioguide as well as a day pass for the Wiener Linien (public transport Vienna). Visit the historic apartment which was Wolfgang Amadé Mozart’s residence from 1784 to 1787. At Mozarthaus Vienna you can find the composer’s only surviving Viennese apartment, where he composed more music than anywhere else. It presents information about the life and work of the musical genius with focus on the great composer’s Vienna years, which represent the peak of his creative achievement. In addition to the main exhibition the Mozarthaus offers temporary exhibitions. This offer includes a CAT Return Ticket, admission to the Vienna Giant Ferries Wheel as well as a day pass valid until midnight for the Wiener Linien (public transport in Vienna). Located in Vienna‘s world-famous Prater entertainment park, the ferris wheel has been turning since 1897 and has become a famous landmark in the Viennese skyline. During the ride you can enjoy breathtaking views of the city. Daily from 09:28 to 17:18, every 6-15 minutes. Combine your CAT ticket with a HOP ON HOP OFF ticket in Vienna. Change from CAT Terminal „Wien Mitte“ to the HOP ON HOP OFF bus and discover the city. This combination offer includes a CAT Return Ticket as well as a HOP ON HOP OFF sightseeing bus ticket for the red line. Discover the city with a HOP ON HOP OFF bus tour. The RED LINE takes you to the most important buildings along the Ringstraße boulevard, from the State Opera past the Imperial Palace, the Museum of Art History, Parliament and Vienna City Hall to Burgtheater. There is also free WIFI on board. At the underground station Stephansplatz, only 10 minutes by public transport from Wien Mitte. This package includes a CAT Return Ticket, entry to the Imperial Treasury as well as a day pass for the Wiener Linien (public transport Vienna). The Imperial Treasury is one of the most important treasuries in the world. It contains a valuable collection of secular and ecclesiastical treasures covering over a thousand years of European history. It houses an extraordinary collection of relics and insignia, like the Crown of the Holy Roman Empire, the Austrian Imperial Crown and further Habsburg treasures of immeasurable value. At the underground station Herrengasse, only 10 minutes by public transport from Wien Mitte. This package includes a CAT Return Ticket, entry to the Museum of Illusions as well as a day pass for the Wiener Linien (public transport Vienna). The Museum of Illusions is Austria's first museum dedicated to illusions and trick art. With its large collection of holograms, stereograms and optical illusions it creates moments of magic. The exhibition promises entertainment, interactivity and educational experiences for visitors of all ages. Unlike ordinary museums this concept is based on interaction with the visitors. For this purpose, participating and touching the exhibits is expressly desired. But be careful, the museum will flip your world upside down. Would you like to stroll around in the city, enjoy some local treats or buy souvenirs without beeing pressed for time? In just 16 minutes the CAT takes you non-stop to the city center and back to the airport – so you can make most of your stopover in Vienna. You can also reach e.g. St. Stephen´s Cathedral within 30 minutes of departung the airport. All package consist of a CAT Return Ticket as well as the tourist attraction. The packages "Coffee brak in Vienna" and "The Vienna Giant Ferries Wheel" also include a day ticket for the Wiener Linien (public transport in Vienna until midnight). Use the security fast lane upon return to the airport and easily reach your connecting flight. The Stopover-tickets can be bought from the CAT sales staff in the baggage claim hall or at the CAT counter in the arrivals hall. 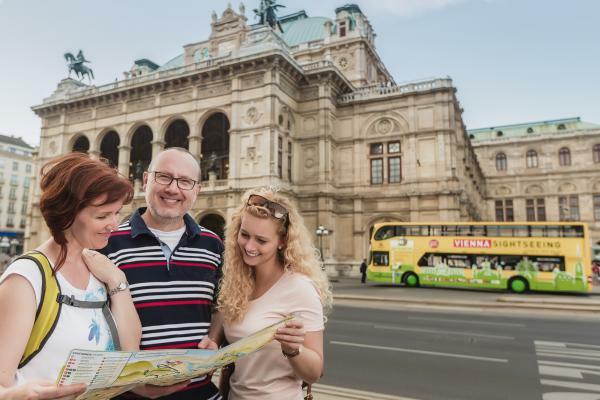 The HOP ON HOP OFF tours of VIENNA SIGHTSEEING are an easy way to explore Vienna. On your audio guide you can choose from 16 languages and jump off and on as often as you like. 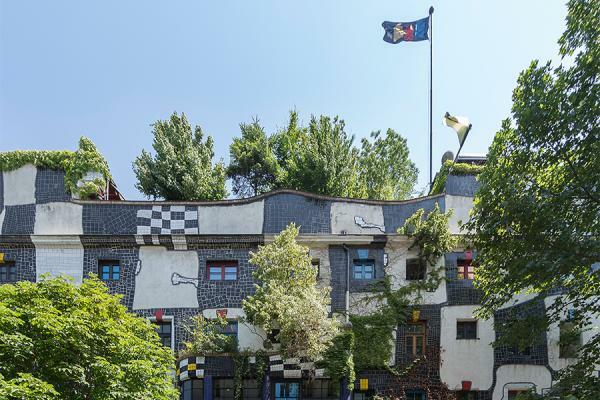 Just 14 minutes' walk from the CAT terminal you can find the KUNST HAUS WIEN, designed by Friedensreich Hundertwasser. The museum and exhibition center has established itself as a fixture within the Viennese cultural scene thanks to top-class exhibitions of contemporary art with a focus on photography. CAT customers receive a reduced ticket for 10,- € instead of 12,- € (presentation of the CAT ticket required). 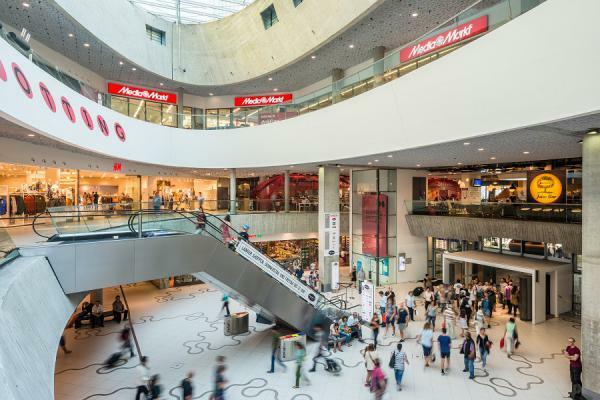 The CAT takes you directly to Wien Mitte - The Mall - the largest and most modern shopping center in Vienna's city center. Whether you are looking for food, beauty and lifestyle or fashion - The Mall offers a large shopping variety right next to the CAT terminal. Saint Stephen's Cathedral is the most famous landmark in Vienna. Located in the city center on the Stephansplatz, the cathedral offers a spectacular view over Vienna from its 136 meter high South Tower. The Gothic nave, the North Tower with the second largest free-swinging church bell in Europe and the catacombs are also open to visitors.